Unlike the dominant research in the framework of cognitive linguistics, which studies »embodied« language mainly through reductionistic experiments and statistical processing of the results, this paper proposes a holistic approach to language by giving epistemological priority to the non-reduced totality of linguistic events. It suggests to study language as a series of individual events by which people relate through all their senses (at various levels of motions and emotions), mutually evoking complex aesthetic reactions and reflections which cannot be explained through general concepts and need to be elaborated rather in a narrative way. Whenever language occurs, it is the result of an interplay of various aspects of human behavior involving extremely complex neural activities. Recent advances in the neurosciences might eventually lead to a more adequate understanding of how complex these activities actually are. However, the latter cannot be turned into a scientific object without losing the subjective quality which makes language a central concern of human self-reflection. Beginning with indications of an »affective turn« in the humanities, this article focuses on the problem of intentional modulations of persons’ affective states. Due to the growth of technical and media capabilities, this topic emerges as increasingly relevant for contemporary philosophizing. From neurotechnologies and technologies of the self to crowd emotionalization and immersion technologies, the arsenal of affective state modulation technologies is outlined typologically, in order to form a category that shall be denominated with the highly ambivalent term, psychotechnics. After a brief overview of the history of the concept and in particular of the psychological discipline in the early 20th century, it will be shown why this concept bears philosophical relevance. Finally and in regard to B. Stiegler’s recent writings on the philosophy of technology the question will be raised whether philosophy itself might be understood as a critical form of psychotechnics. For many decades, Heidegger’s critique of Kant was identified with his book on ›Kant and the Problem of Metaphysics‹ (1929). Thanks to the publication of several of his lectures from the 1920s, however, it has become increasingly clear that Heidegger’s critique comprises far more than said book. In the present article I explore the idea that Heidegger’s lectures on ›Basic Problems of Phenomenology‹, held in the summer term of 1927, are of particular importance for our understanding of the relationship Heidegger felt there was between himself and Kant. These lectures can be read as a »historical« introduction into ›Being and Time‹. Of course, Heidegger does not present himself as a historian of philosophy but acts as a philosophical reader of Kant in order to expound the principal ideas of his own philosophy. My central claim is that it is through Kant’s moral philosophy that Heidegger attempts a »historical« introduction into his own conception of selfunderstanding. Both in Posthistoire and in the current boom of anthropological reasoning the question concerning history seems to have been left behind. Even though the philosophy of history no longer aims to render a meaningful »grand narrative«, it is concerned with the question of the dynamic of history and its availability to its human subjects. Despite all gestures of abandon even French posthuman and post-historical philosophy indicates such a relation. This article visits one of the »primordial scenes« of the French tradition, Alexandre Kojèves’s Hegel seminar during the 1930s, and analyzes his Hegel reading in its specific ambiguity. Kojève’s seminar passed a double legacy to French theory: a very selective rendering of Hegel, and at the same time a conceptual potential to overcome Hegel. Related to this legacy the article explicates how Jacques Derrida attempts to conceive both the individual and historical dynamic on the basis of the concept of the unconscious. Georg W. Bertram: Arbeit am amphibischen Problem. 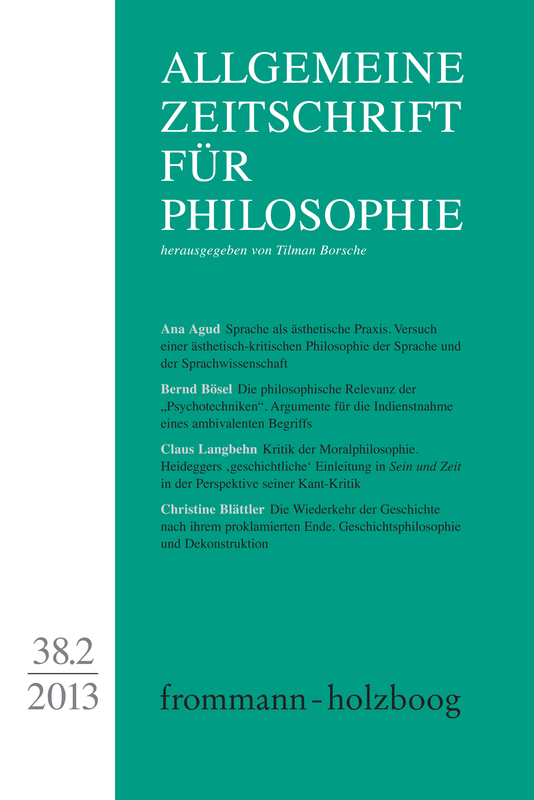 Hegels Ästhetik und ihre jüngste Aktualisierung (zu Robert B. Pippin, ›Kunst als Philosophie‹).